Climate: Cartagena de Indias has a warm semi-arid weather with average temperatures for July 2019 of 26-31°C (79-88°F) and a relative humidity +90%. It is remarkable that although the weather tends to be warm all year round, the presence of a breeze makes the climate pleasant. Seasons in Colombia: Colombia is located on the northern part of South America. It has no distinct seasons. Weather conditions don’t vary in big scales during whole year and it is more dependent on location and altitude than on time of the year. There are several climatic zones in Colombia and temperature depends on altitude. It reduces by about 6 °C per each 1000 meters of altitude. Caribbean coasts have hot climate with rain seasons (not normally in July), and Bogota (located on a high plateau in the Northern Andes Mountains) is 2640 meters (8661 feet) above sea level and average temperatures for July 2019 are of 10-18°C (50-64°F). Time zone: Colombia Time (COT), UTC -5. The IANA time zone identifier for Cartagena is America/Bogota. Currency: The currency in Colombia is the Colombian Peso (COP). 1 EURO is about 3,600 COP. 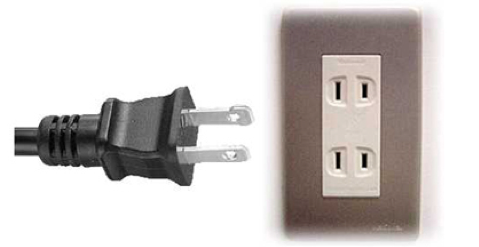 Voltage: Colombia has 110-120-volt electricity (as in the USA) and uses same plug as the USA (see picture).